Pieter van der Merwe raised the Science Museum, London’s painting of ‘Whaler 'Harpooner'’, then listed as by an unknown artist, painted 1850–1875. 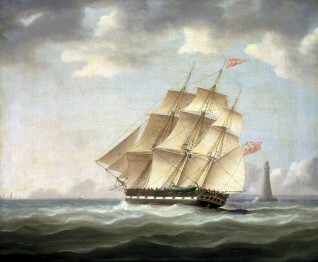 The date looked late for the painting, and the ship could be ‘Blackwall’, which was built in 1830, and appears in a painting by William John Huggins (1781–1845). Was the Science Museum's artwork a later painting by Huggins, or another artist? It appeared that the lighthouse in the picture could be Smeaton's Eddystone tower, which was in use 1759–1877. Art Detectives found that one ship was called the 'Harpooner': built by the Greens at Blackwall in 1830–1831, her last appearance in records is 1857, after she was wrecked. After more discussion, Pieter van der Merwe suggested that the artist and date are updated to 'British school, c.1831, due to the paintings provenance and due to the fact the ship is shown in pre-1848 rig. It is unlikely to be a retrospective post-1850 view. Pieter also noted that the lighthouse is probably intended as the Eddystone. The painting was given a date of c.1831, and listed as by British School: if anyone has any more information, please do propose another discussion from the artwork’s page. Which 'Harpooner' is depicted and where is the location? Is William John Huggins the artist?